Display table will be provided for the duration of the event. In the registration form - for PTIN number - please enter 100. You will also have to choose an Educational Track - either one you choose is fine. Your registration fee includes 2 lunches plus breaks during the CE event. Your registration fee includes 2 lunches plus brakes during the CE event. 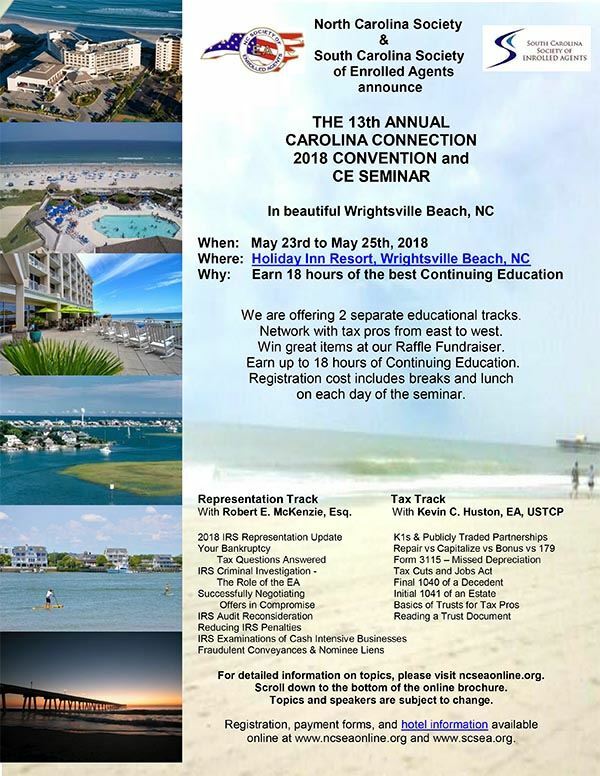 NCSEA Member Registration is $350. You must login to get NCSEA member pricing. Shell Island is and All Suite all Oceanfront property. Call 910-256-8696 or 800-689-6765 to make reservations. Group code is SEA. Group rate is $169 and is only good until April 22nd or until the block sells out.